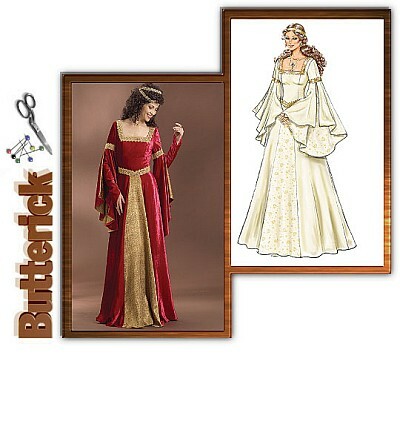 Fitted, flared, floor length dress has lined bodice, three piece sleeve with finger thread loop and back lacing. Purchased trim and eyelets. Notions description...NOTIONS: 21/2 yds. of 1/8" Cord, Twenty-six Metal Eyelets, 31/4 yds. of 11/2" Ribbon or Flat Trim. Satin, Sateen, Crepe, Velvet, Velveteen and Panne. Contrast: Brocade and Jacquard. Lining: Cotton, Cotton Blends and Rayon.